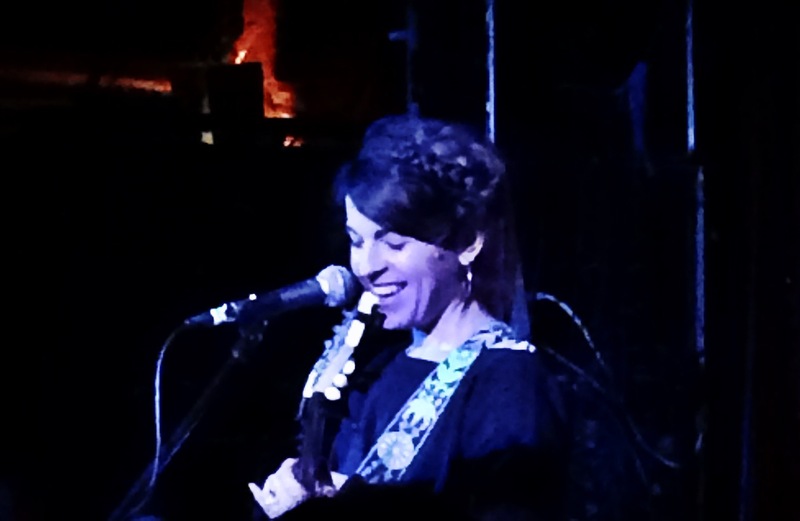 Last night Victoria and I had the privilege of seeing Princess Leia open the show for Iron & Wine — and by Princess Leia, I mean Jesca Hoop, a former Mormon turned braid-wearing folk singer. When she first starting singing and whining about how she had just gotten off a plane from the UK where she now lives, I thought her set would be terrible. In actuality, it wasn’t all that bad. Sure, she sometimes forgot how a song went due to jet lag, but she has a rich voice that can carry her unique and alternative songs. Even though the majority of her lullaby folk songs made me a little drowsy, I really enjoyed her performance because she told us the back story behind each song she sang. One story that I found to be very endearing was the one about her mother. Jesca was raised Mormon and claimed that her mom was so perfect she was always “destined for heaven.” When her mom was in her 50s she was diagnosed with stomach cancer, so Jesca, a self-proclaimed pot enthusiast, told her mom to start smoking weed to cope with the pain. Jesca didn’t think her angelic mom would ever risk her chances of getting into heaven, but she eventually found herself talking on the phone with her mom while they both got high together. Jesca said that her mom really opened up to her while high, so the minute she hung up the phone Jesca wrote a song in one sitting which she said rarely happens. I found this anecdote to be really touching and helped me learn more about Jesca Hoop and her music. Even though Jesca has a strong, rich voice, I would definitely say her best feature is her storytelling abilities — a characteristic I wish more bands/artists had. After Jesca exited the stage she joined the audience (standing right behind me and Victoria) for Iron & Wine, also known as Sam Beam. I am slightly ashamed to admit that I first heard Iron & Wine’s hit song “Flightless Bird, American Mouth” in the Twilight movies, but ever since I became familiar with his music and grew up a little bit from my middle school days, I’ve learned to appreciate Iron & Wine’s music a little more. I was honestly expecting a killer show last night, but I thought it was only okay. I think the energy on a Sunday night is completely different than the energy on a Friday night. The artist and the crowd are both tired and worn out from the weekend, so the dynamic is a little different. For example, Sam Beam got on stage and asked the crowd what they wanted to hear. It didn’t seem like he really had a plan for the show, and when he started playing songs that the crowd requested he often forgot how they went. Eventually he figured it out, but I feel like if you are an artist going on tour you should probably brush up on your own music before you dare to play it. Aside from his lack of enthusiasm and energy, I thought his actual performance was just “ehhh.” It could have been a lot better, but it also could have been a lot arose too. His vocal performance was enjoyable and nothing to scoff at, but it wasn’t too memorable either. All in all, I would say that the highlight of the night was Jesca Hoop only because she kept me awake with her stories and charisma. Folk music, especially acoustic music like it was last night, is so soft and melodic that it can very easily put you to sleep, so I think it’s really important for these folk singers to engage the audience to ensure that they stay awake and that is exactly what Jesca Hoop did. Iron & Wine engaged with the audience, but he only engaged with the audience to ask us what we wanted to hear — the best part of Iron & Wine’s performance was Jesca Hoop singing along to his music and giggling behind us. This entry was posted in Concert Reviews and tagged acoustic, alternative, charisma, cleveland, cleveland concerts, Cleveland Music, england, folk, folk music, funny, Grog Shop, guitar, Indie, iron & wine, iron and wine, jesca hoop, jessica hoop, music, sam beam, sleepy, UK. Bookmark the permalink.